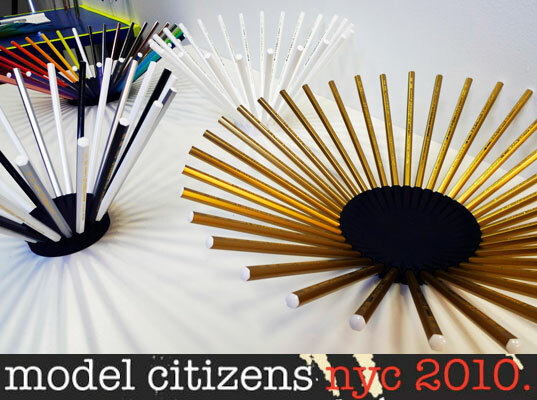 It's no secret that here at Inhabitat we love independent designers for the fresh bursts of innovation that they provide, which is why we were thrilled to check out this year's Model Citizens show during New York Design Week. The exhibition showcased an incredible collection of furniture, housewares, and jewelry by a world-wide cast of up-and-coming designers. From beautiful sustainably-crafted furnishings to clever designs that find extraordinary uses for everyday materials, read on for our favorite green finds from this year's show! In stark contrast to the cavernous halls and thousands of booths at ICFF, Model Citizens brought together a carefully curated community of independent designers. We were thrilled by the originality and inventiveness of the designs on display and we uncovered lots of green design gems as we met and mingled with the 50 or so designers in this year’s showcase. Michiel Cornelissen showcased a stunning set of fun and functional bowls that are formed from everyday pencils popped into a mold. 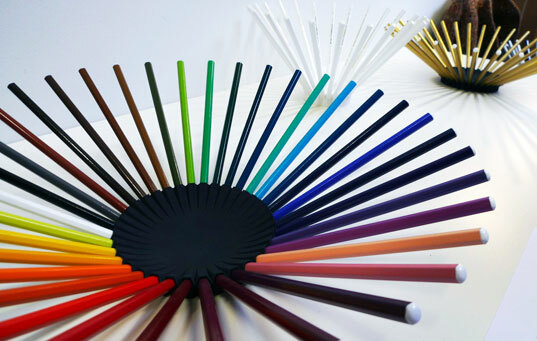 We love how each shade is artfully arranged, and the best part is that you can easily pull one out to use it when needed. These gorgeous hanging lamps by Designsince are made from repurposed spools of measuring tape. They’re available in inches or centimeters, and each measurement displays a different pattern as the spools gradually expand into shades. 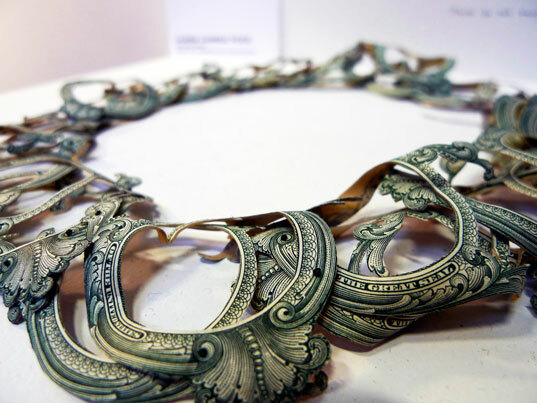 Lauren Vanessa Tickle showcased a stunning necklace composed of carefully cut-out dollar bills. The piece is part of her Value Exploration series, which questions the the principles that drive currency and consumerism. For The Guyana Project 10 Pratt students spent 10 days working in a Guyanese factory with local workers to create a series of beautifully sculpted, locally-sourced and produced furnishings. Jason Hu designed this playful “Perch” chair that can be rotated to provide a variety of different seating positions. 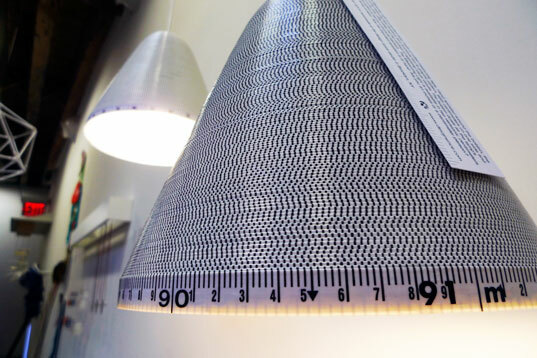 These gorgeous hanging lamps by Designsince are made from repurposed spools of measuring tape. They're available in inches or centimeters, and each measurement displays a different pattern as the spools gradually expand into shades. Michiel Cornelissen showcased a stunning set of fun and functional bowls that are formed from everyday pencils popped into a mold. We love how each bowl offers an artfully arranged spectrum of shades, and the best part is that you can easily pull one out to use it when needed. Michiel Cornelissen also exhibited several hanging geometric lampshades made from pencils joined together with a simple set of connectors. 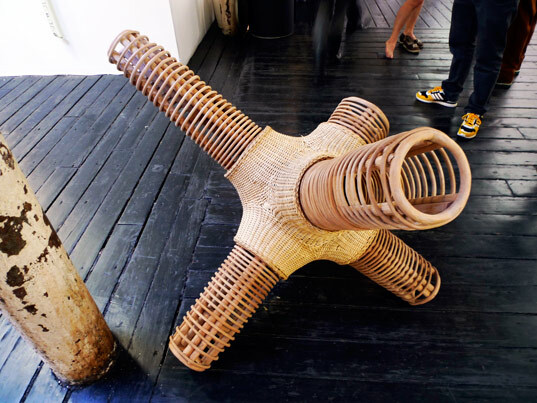 For The Guyana Project 10 Pratt students spent 10 days working in a Guyanese factory with local workers to create a series of beautifully sculpted, locally-sourced and produced furnishings. Mike Jozewicz' Twisting Kufa lamp was inspired by unusable irregular pieces of kufa found laying around the Liana Cane Factory. Catherine Merrick designed this beautiful "Bee Wing" lamp for The Guyana Project. To create it she worked with Wai Wai weavers using traditional techniques that code symbols for fences, bee wings, and stars into its fabric. Sahar Ghaheri designed these beautiful Pepper Pod chairs for The Guyana Project. Inspired by traditional Guyanese furniture, they sit low to the ground, offer a variety of different seating positions and can be flipped over to serve as rocking chairs or stools. For The Guyana Project Jason Hu designed this playful "Perch" chair that can be rotated to provide a variety of different seating positions. This beautiful hanging lamp was designed by Helene Kenny in collaboration with The Guyana Project. Kenny worked with traditional Wai Wai weavers in the Amazon along every step of the process - from harvesting Mukra vines to the piece's final fabrication. Joshua Newman's Slow Life Designs are focused around extending a product's life cycle as well as its lasting effects upon a person's health, well-being, and patience. We loved his leafy green wall planters! Joshua Newman also showcased a beautiful table that features a planter set in the middle. A lengthwise slit allows your potted plants to sprout up through the table's center. Lauren Vanessa Tickle showcased a stunning necklace composed of carefully cut-out dollar bills. The piece is part of her Value Exploration series, which questions the the value of currency and consumerism. Glenn Jufer's "Good Wood" lamp caught our eye with it's energy-efficient array of 200 LEDs. The sleek design can provide direct light or be hung on the wall to create accent lighting, and it was actually inspired by parking blocks found in lots. Tamara Petrovic and Garner Oh showcased an elegant geometric "Caterpillar Chair" that is folded from a single sheet of sturdy felt. We loved the project's simple design and economy of materials. Niels Cosman Studio showcased a beautiful set of handcrafted furnishings made from locally-sourced wood. Neils makes every effort to conserve resources throughout the production of his furnishings, saving even the smallest scraps to be used for other projects. Niels Cosman Studio makes these beautiful bell jar stands from scraps of wood sourced from other projects. Munire Kirmaci showcased a set of slip cast hand-finished "Wounded Vases". Each smooth white vase is punctuated with a wound that lets its red interior bleed through, showing "how fragile love can be". These beautiful pins and necklaces are crafted from bits of cracked ceramic that have been polished smooth. The lamp lifts upwards towards the ceiling!